Southern Illinois University Edwardsville welcomed approximately 700 guests, including an all-time high of nearly 300 prospective students, to campus Friday, March 17 for Preview SIUE. 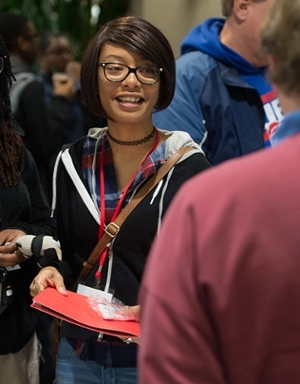 This program, combined with the February Preview SIUE program, welcomed nearly 600 prospective students and more than 1,500 guests. The day-long program provided opportunities for high school and transfer students to learn more about the University’s array of academic programming, student life opportunities and available support services. The day is tailored as an open house, with information catering to both prospective students and their guests. More information on visit days is available at siue.edu/visit/. Photo: Prospective SIUE student Jina Garry, of Springfield, visits with a faculty member from the College of Arts and Sciences during Preview SIUE.